New Delhi, Sep 7 (IANS) Expanding their military relations, India and the United States on Thursday decided to carry out a new tri-services exercise off Indias eastern coast in 2019. The two sides also decided to establish secure communication between their defence and external affairs ministers. 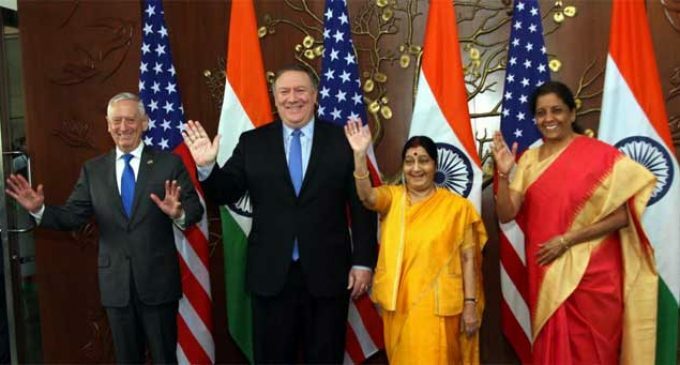 The new military exercise was announced in the joint statement issued after the inaugural India-US Ministerial 2+2 dialogue and also by Defence Minister Nirmala Sitharaman in her remarks at the joint briefing which was also attended by External Affairs Sushma Swaraj, US Secretary of State Michael R. Pompeo and US Secretary of Defense James N. Mattis. “Recognizing their rapidly growing military-to-military ties, the two sides committed to the creation of a new tri-services exercise and to further increase personnel exchanges between the two militaries and defence organisations,” the joint statement said. In her remarks, Sitharaman said that India’s defence forces carry out extensive training and joint exercises with the US and the joint exercises have acquired greater complexity and newer dimensions, both bilaterally and in wider formats. “To enhance our synergies in this area, we have decided to carry out, for the first time, a tri-services joint exercise with the United States off the eastern coast of India in 2019,” she said. The joint statement said the ministers reviewed the recent growth of bilateral engagements in support of maritime security and maritime domain awareness, and committed to expanding the cooperation. They expressed commitment to start exchanges between the U.S. Naval Forces Central Command (NAVCENT) and the Indian Navy, underscoring the importance of deepening their maritime cooperation in the western Indian Ocean. The joint statement said that India and the US welcomed the launch of the 2+2 Dialogue as a reflection of the shared commitment by Prime Minister Narendra Modi and President Donald Trump to provide a positive, forward-looking vision for the India-U.S. strategic partnership and to promote synergy in their diplomatic and security efforts. They resolved to continue meetings in this format on an annual basis. The ministers said India and US must continue to lead global efforts to promote peace, prosperity, and security. The statement said the two sides were committed to work together on regional and global issues, including in bilateral, trilateral, and quadrilateral formats recognising that they are strategic partners, major and independent stakeholders in world affairs. “The two sides further decided to establish secure communication between the Minister of External Affairs of India and the U.S. Secretary of State, and between the Minister of Defence of India and the U.S. Secretary of Defence, to help maintain regular high-level communication on emerging developments,” he said. The ministers reaffirmed the strategic importance of India’s designation as a Major Defense Partner (MDP) of the US. They expressed commitment to expand the scope of India’s MDP status and take mutually agreed upon steps to strengthen defence ties. They welcomed the inclusion of India by the United States among the top tier of countries entitled to license-free exports, re-exports and transfers under License Exception Strategic Trade Authorization (STA-1). Noting the rapid growth in bilateral defense trade and the qualitative improvement in levels of technology and equipment offered by the United States to India in recent years, they also expressed commitment to explore other means to support further expansion in two-way trade in defence items and defence manufacturing supply chain linkages. The ministers reaffirmed their commitment to continue to encourage and prioritize co-production and co-development projects through the Defense Technology and Trade Initiative (DTTI), and to pursue other avenues of defense innovation cooperation. “In this regard, they welcomed the conclusion of a Memorandum of Intent between the U.S. Defense Innovation Unit (DIU) and the Indian Defence Innovation Organization – Innovation for Defence Excellence (DIO-iDEX),” the statement said. The statement said that the next 2+2 meeting is to be held in the United States in 2019.